I’ve just joined Kiva as a lender, this is one of things things I’ve been thinking about for a while – and I’m really excited to have made my first loan! Kiva facilitates microfinance loans through their website, working with field partners across the world to manage the loans and repayments. Yes, repayments. This is not a charity, your money is used to support an enterprising person’s needs, and once they get up and running they repay the loan. With a 98% repayment rate, it is fair to say this is working! My interests are in food growing (obviously! ), and building security for communities and this will be my focus for lending. In particular, I prefer to support crop production over animals, and people that are growing food (as opposed to participating in the trading of food). I know this sounds a bit judgy, but these are my values and it makes me feel good about supporting enterprises in far away lands that are growing food in sustainable ways. Truly, if you look around the potential loans you can make on the site, you can very clearly see that there are so many worthy enterprises to support. The plan is to make a new loan of $25USD each month and keep tracking repayments and success stories. If you would like to also become a lender through Kiva, you can do so here. A once off loan can make a world of difference, so please don’t feel that you have to commit to an ongoing payment. This month I am lending $25USD to Tabitha, so she can purchase seeds for her horticultural enterprise. Tabitha is 23 years old. She is a smallholder farmer based in Kitale, which is a small rural town in the Rift Valley region of Kenya. The adversity that has followed her has not been an obstacle for this woman who has not left her dreams behind and wants to succeed. For four years, Tabitha has been a mixed farmer. She keeps dairy cattle and poultry on her farm. She also grows vegetables, among other crops. Despite prevailing animal diseases, Tabitha finds dairy farming to be the most enjoyable commercial farming activity. Besides dairy farming, she has a deep connection with gardening. 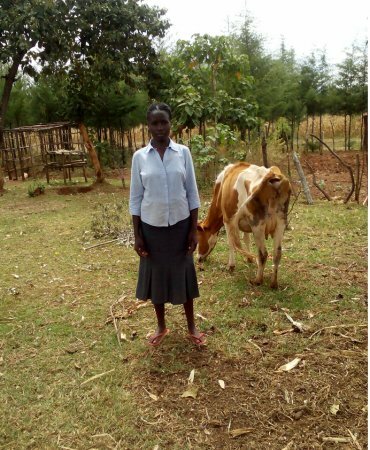 Tabitha is requesting a loan, which she will use to buy seeds to start horticultural farming. She is very excited to start growing different varieties of crops for commercial purposes. The demand for vegetables and other greens is always high. Income from this venture will cover the high farming expenses she has to deal with currently. In the long run, with increased income, she will finally be able to satisfy her family’s basic needs. You can read more about Tabitha here. Good luck Tabitha! I hope your seeds grow well and your first crop is profitable for you. Are you already a Kiva lender? What can you tell me about your experience so far?